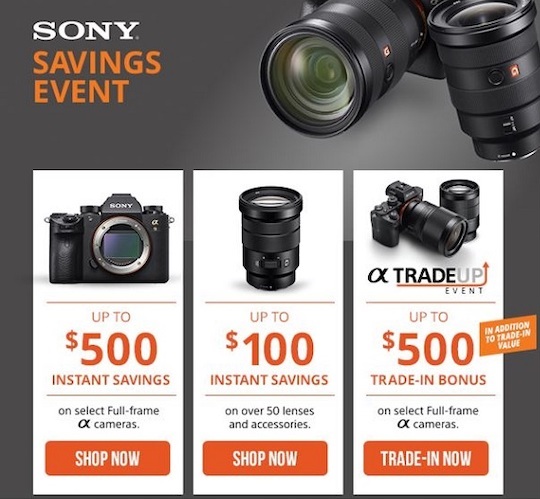 Similar to Nikon, Sony has a new "trade-up" offer in the US - see the details at Adorama and B&H Photo (cash in your old camera or lens for up to $500 trade-in bonus towards a selection of Sony products). There are also some new instant savings and additional discounts on selected Sony Alpha cameras - see the details at Adorama and B&H Photo. This entry was posted in Deals, Sony and tagged Rebates. Bookmark the permalink. Trackbacks are closed, but you can post a comment.